Delicious Banoffee pie filled with fresh toffee, delicious bananas, and topped with decadent fresh whipping cream. Garnish this sweet treat with a little chocolate shavings and you have a delicious dessert to share! I finally went grocery shopping this last week. We suffered through bare cupboards for a couple of weeks! So we MIGHT have gone a little bit overboard on the groceries. We ended up with more perishable items than we could handle. A bunch of bananas got shoved to the back behind other things on my counter. They wound up looking rather “over done.” My choices were to make a last minute banana bread or whip up some other banana dessert. This yummy pie is a combination of banana and toffee, hence the name Banoffee! This flavor combination is genius! It’s a very easy pie to make. It just requires a little bit of time if you make it all from scratch. SO worth it!! I went the slower (from scratch) route with the toffee. I made it from boiling a can of sweetened condensed milk. We got the recipe from our friend Inger. It’s known in culinary circles as Dulce De Leche You can get the easy recipe for it HERE. It’s simple, you just toss some unopened cans of sweetened condensed milk in a big pot of boiling water and boil away for a couple of hours. The graham cracker crust is also very simple to make. Just grind up some graham crackers, mix it with a stick of melted butter, put it in a pie pan and bake for 10 minutes at 350 F. To make this recipe COMPLETELY no bake. Just don’t bake the crust! I have made many no bake graham cracker crusts by replacing the butter with melted coconut oil. Mom’s No Bake blackberry Cheesecake bars use this method. So easy! Make sweetened condensed milk into toffee according to the linked instructions. Grind up 1 package and graham crackers and mix together with 1 stick of melted butter until a sand like paste forms. Press the graham crackers into the bottom of a pie plate to form a crust. Bake the crust in the oven at 350 F for 10-12 minutes or until it starts to brown on the edges. You can arrange the bananas anyway you would like! 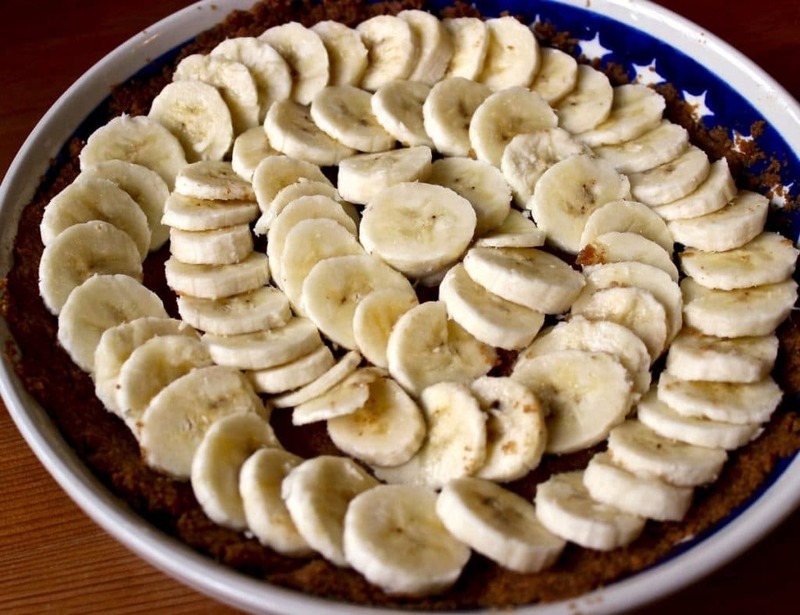 Next, make sure the pie crust is cool and slice bananas into rows in the bottom of the pie plate. Pour the cooled toffee over the top of the bananas. Top with toffee over the bananas! Whip the whipping cream and place in piping bag if you wish. I piped a rosette design using a Wilton 2D tip. You don’t have to do this step if you don’t want to. It just helps pretty up the look of the pie. 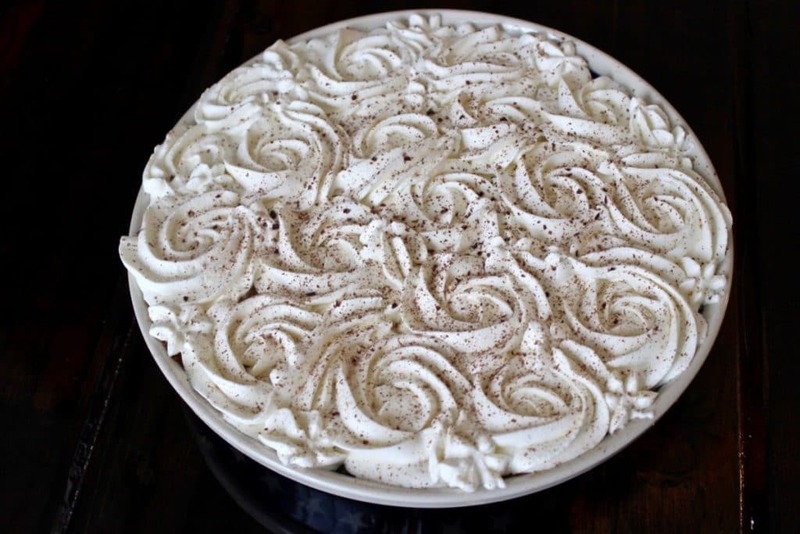 Spread chocolate shavings over the top of the pie. Grind up graham crackers and mix together with 1 stick of melted butter until a sand like paste forms. I piped a rosette design using a Wilton 2D tip. You don't have to do this step if you don't want to. It just helps pretty up the look of the pie. This pie is no bake and very quick if you buy the crust and toffee. Make this dessert ahead and keep it cold for best results until immediately before serving. Such a gorgeous pie! Looks so delicious and so beautiful! 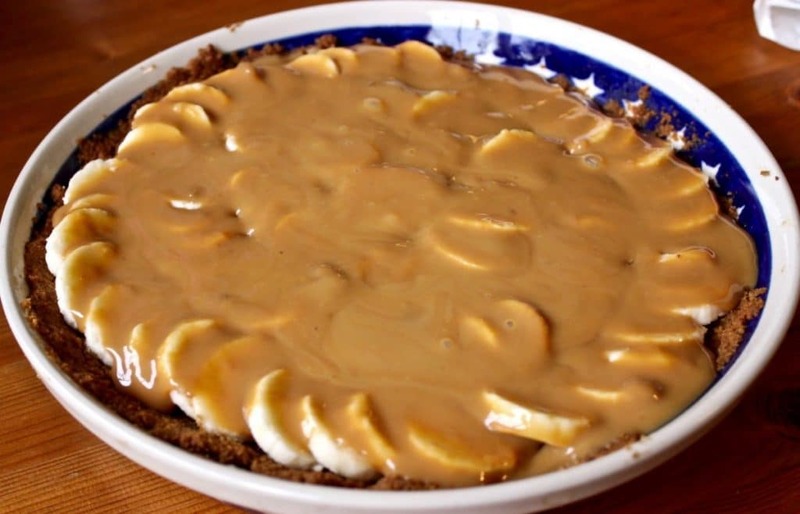 I’ve never had banoffee pie but yours looks so amazing, I’ll have to try it! This is so pretty! You did such a beautiful job with the rosettes on top. I’d be happy to see this on my Thanksgiving dessert table. Jessica, It will definitely be on our Thanksgiving table. We have family memebers that insist! Thanks so much for the visit! Your Banoffee Pie looks amazing! It is one of my favorite pie recipes but have never tried to make it ! Will definitely give it a go as I didn’t have one for ages. Thanks for sharing it! It’s great to see you Oana. Let us know if you make this recipe. Love to know how it turns out for you! Banana and toffee together sounds scrumptious! I absolutely love fresh whipped cream too! 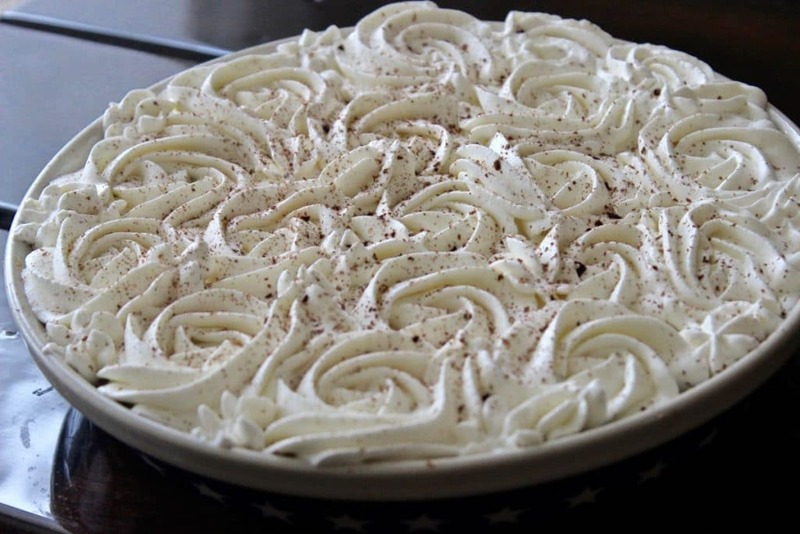 Love how pretty this Banofee pie looks with the white roses. Thank you Sandra. This pie is so easy and delicious it makes taking the time to add the decorated topping no trouble really. kayti says the rose design is very easy to do. You have made this look SO beautiful! I’m thinking of bananas on graham crackers even for a snack tomorrow 🙂 Great ideas! This sure is a crowd pleaser! I just wish I had one here with me right now. What a pretty pie and it sounds delicious with the fresh toffee, yum! It really is a simple to make, yummy pie Joy! This is a beautiful dessert. It’s almost too pretty to eat. I’m pinning this for later. It’s so simple. 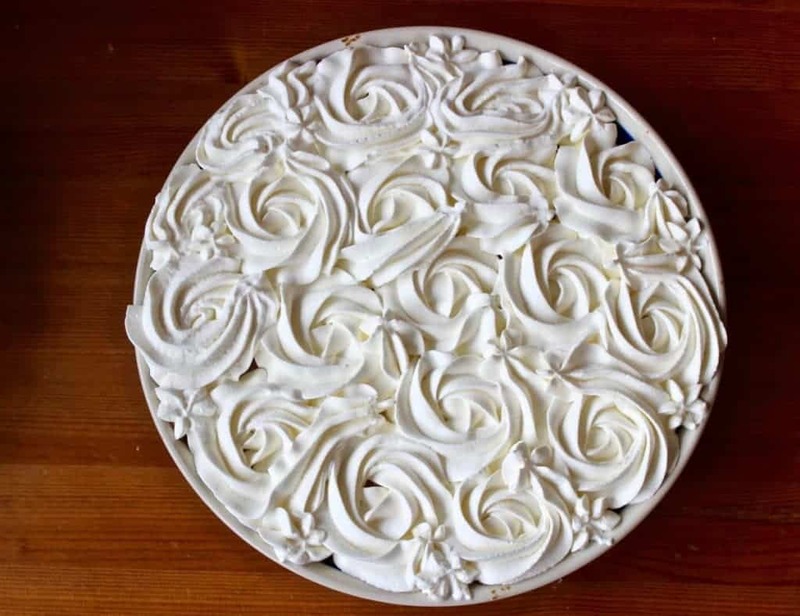 I love banoffee pie, and love how you have piped the swirls on it to make it truely special and dinner party worthy! Love the name of this beautiful pie. I think I’m going to try to make this as I always seem to have bananas that need to used and the homemade toffee sounds delicious. Thank you Erlene, The homemade toffee is so easy and makes it a snap to do this pie. Just remember you’ll need all day to simmer the toffee or just make it ahead! What an elegant decoration and I bet its taste is equally delicious! It is Katerina. Kayti did an excellent job on this pie. It’s so easy to make and totally delicious! Diane! Another super yummy recipe. I can’t imagine how delicious this is since its all made from scratch. It is beautiful and looks amazing!! Thank you Whitney. 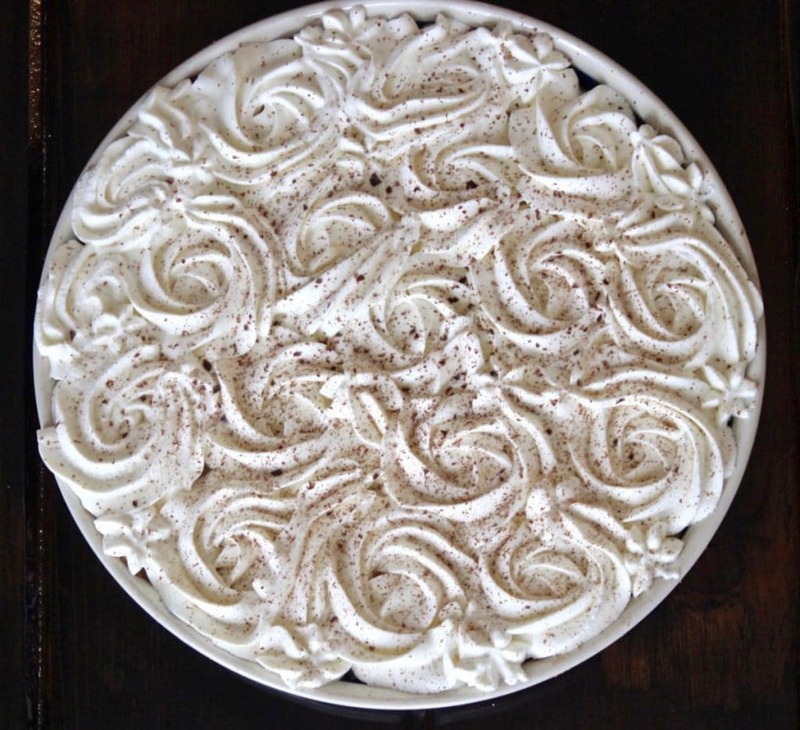 Kayti created a truly elegant, simple and tasty pie! How beautiful! What a show stopper!! I love how very easy it is to make. I’m looking for beautiful desserts for our Church Christmas dinner! Marjie this is perfect for a large crowd. It is so simple and is well loved! Beautiful! What a great dessert for the upcoming holidays. The swirls on top look amazing. This is really great for a large holiday meal with lots of people to helpe eat this simple, rich dessert! This is so darn pretty! Like a Wedding Pie ! I’m so going to make this for the holidays, my favorite things in a pie, heck yeah! I hope you love it as much as we do Florentina! Even my son, who is NOT a dessert fan, loves this pie! What a beautiful pie! I love the bananas and the sprinkle of chocolate! So delicious! Pinning this one for sure!